25 Jul How Can These Things Be? What “impossible” things have you done so far this morning? What about this weekend? None? Really? Did you get out of bed and walk pain-free around your house on an artificial hip or knee? Did you log on to your e-mail, download a message, post something on Twitter or Instagram, or FaceTime with a relative who lives in another part of the country or world? Did you take a pill that regulates your blood pressure? Did you buy groceries or get a hamburger at a drive-through window in the middle of the night? Did you drive somewhere in a computer-on-wheels, using the dashboard GPS or back-up camera or motion-detecting side mirrors to get safely to your destination? Did you set your home thermostat from a remote location? All these things, and thousands more, would have been rejected as “impossible” not that long ago, in some cases only two or three decades ago. But today, home electronics, microchip technology, medical, surgical and pharmaceutical wizardry, and a culture with 24/7/365 services has made much of what seemed impossible a generation ago part of common everyday life. Not everyone, of course, enjoys these modern conveniences. My 100-year old grandmother never has learned to use a computer, though she did finally get a cell phone. Some folks don’t trust things they can’t understand, like new medical devices, and others don’t want the invasion of privacy that comes with some of the new technologies. Still other people are simply resistant to change, preferring the old and familiar ways of doing things. Maybe that is what is troubling Nicodemus. John 3 tells of an encounter between two teachers talking to each other about matters of faith. Jesus is “a teacher who has come from God,” and Nicodemus is identified as “a teacher of Israel.” Nicodemus is clearly having a hard time following Jesus’ lesson. He is totally flummoxed by the new and unexpected things Jesus is saying, things that everyone “knows” are impossible, right? How is it possible to be born “from above” after our physical birth is long past? How is it possible to see and enter the “kingdom of God” while our feet are still firmly planted on this Earth? How is it possible for sinful men and women to “ascend into heaven”? How is it possible for mortal creatures such as ourselves to gain “eternal life?” How is it possible? How can these things be? Jesus, for his part, appears surprised that Nicodemus is having such a difficult time: “Are you a teacher of Israel, and yet you do not understand these things?” Jesus imagines that Nicodemus should be well schooled in issues of spiritual rebirth. From the barren future of Abraham and Sarah, to the grinding oppression of Pharaoh, to the dry bones of utter loss in exile, the history of Israel is well stocked with stories of impossible newness from above and the rebirth of a people. Jesus the teacher moves on with the lesson. The life of faith, he says, is born of the Spirit. That means it is not something we can manufacture ourselves. It is not an achievement that we accomplish and for which we can then take credit. It is not the same thing as acting like a nicer person, learning more, or working harder. We cannot birth ourselves, nor can we give ourselves a new start. No one can enter the kingdom of God, or even see it, without being born from above, of water and Spirit, says Jesus. Like life itself, faith is a mystery beyond our understanding, a gift that only God can give. To fully receive this gift, Jesus wants us to know that God’s kingdom and the new life, the eternal life that he speaks of has already begun and indeed, is a reality that we are to begin to live now. Eternal life and heaven are not ethereal promises for someday, in the sweet bye and bye when we depart this Earth. Eternal life has already started for those who belong to God. This reality is to form the foundation upon which we live our lives. God’s kingdom has come. The Spirit is blowing. That which seemed impossible is happening. Jesus has a lot to say about the Spirit. The Spirit is loose in the world in surprising and disruptive ways, transcending human understanding and control. No human rules or traditions can contain the Spirit. Like fire, the Spirit is powerful and unpredictable, bringing light and warmth to cold and dark places. And the Spirit’s reach is universal. No corner of creation is off limits to the Spirit’s transforming power. At the same time, the Spirit indwells the church and is given to the church and through the church as a means of God’s grace activated in the world. The concrete practices that structure life in the Christian community are, to use Craig Dykstra’s phrase, “habitations of the Spirit,” places where the Spirit transforms us personally and corporately. The Spirit’s power is channeled through prayer and sacraments, through acts of mercy and outreach, through potlucks and Session meetings. In and through the church’s practice of baptism, the Spirit is at work bringing new life. Through the things of earth—water, wine, bread, oil—the whole community is born anew into the kingdom of God. In verse 14 Jesus teaches Nicodemus about the significance of his upcoming death with a story about Moses from Numbers 21. Israel is crying out in the wilderness for deliverance from a plague of deadly serpents. God tells Moses to craft a bronze image of a serpent and lift it up on a pole. In a seemingly impossible reversal, all the Israelites who look upon this symbol of death find healing and life. Jesus, too, will be “lifted up,” not on a pole or a staff, but on a cross. Those who gaze upon him, believing him to be the Son of God will find eternal life. Through his death, he becomes the source of life and salvation for all, as John will say later in his gospel (12:32). 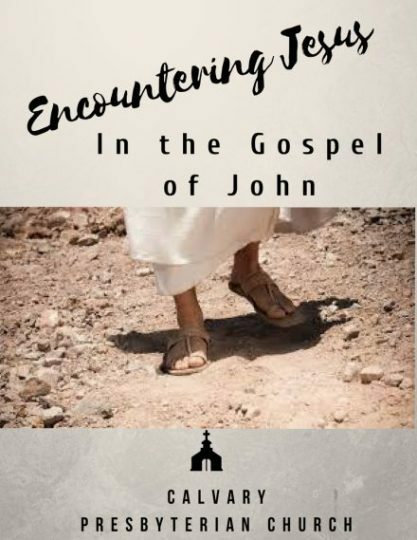 In another seemingly impossible reversal, John portrays the cross, an instrument of sheer terror and torture, as the ultimate instrument of hope and healing and the crucifixion as the hour in which Jesus is glorified. How can these things be, asks Nicodemus? Good question. It is a fallacy to think that we arrive at faith by understanding the things of God. The Israelites dying of serpent bites in the wilderness did not first understand how a serpent on a pole could save them, and then put their faith in God’s surprising choice of deliverance. They first trusted that God would deliver them, and their experience of being healed led to understanding the efficacy of Moses’ strange action of lifting up the pole with the serpent. Likewise, eternal life in Jesus does not require perfect understanding, but simply belief. Simone Weil observes that we do not start with an intellectual verification of heavenly things, and then proceed to belief. Faith starts in the dark, without light, just as Nicodemus’s nighttime encounter with Jesus started in the dark. Faith does not depend on certitude and understanding—these are the fruits of faith, not its precondition. Trusting in our teacher Jesus, we take a leap of faith before we see exactly where it is all going to lead. Spiritual understanding comes, afterward, with experience. How can these things be? The answer to the question is that we have an impossible God. That is to say, a God who defies what is possible, who transforms doubting, wavering, unbelief into obedient faith. Our impossible God outlines the core of this reality in perhaps the most memorable verse in all of scripture: “For God so loved the world that he gave his only Son, so that everyone who believes in him may not perish but may have eternal life.” (John 3:16) How can these things be? All things are now possible because “God so loved the world.” Jesus is proof of God’s commitment to doing the impossible. The most “impossible” obstacles that stunt our lives are not technological challenges or physical disabilities or the realities of time and space. The most debilitating “impossibilities” we face are those that are rooted in wrong relationships, eroded emotions, hurtful habits and bad behaviors. Every one of us at some point or another faces some looming “impossibilities”, but the question for us when they occur is, what are we going to believe about those situations? Or better yet, who are we going to believe? I don’t think I can face another day of working at my “impossible” job. I am facing an “impossible” situation with one of my family members. The grief over the loss of my loved one feels “impossible” to overcome. I have “impossible” monthly bills that now outweigh my monthly income. The anger/resentment/depression/envy I feel seems “impossible” to deal with. I have been diagnosed with an “impossible” health crisis. There is a problem in my life that I am finding “impossible” to face. It is because God so loved the world, with a love that we will never be able to fully grasp this side of eternity—because of that love, nothing is impossible with God. Thanks be to God. Amen.